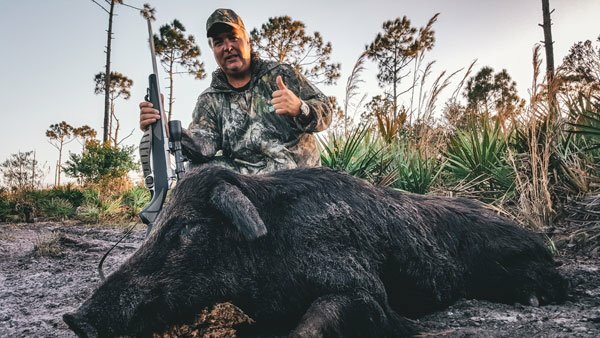 Hog Hunting in Florida has developed a name for itself between the many styles of hunts, the excitement, and the flexible hunting laws and regulations. Over the years, this invasive species has become a highly sought after rush amongst the hunting community. Hunters from around the Nation come to Florida in search of the adventure, and that big trophy boar. The ecosystem around hog hunting in Florida is based around environmental protection as well as sport. These feral pigs are not native to Florida, and wreak havoc within natural habitats, and destroy farmland and crops. They are clearly labeled as a nuisance species, and can be aggressive as well. With that being said – in a way hog hunting in Florida can almost be looked at as a service. The most common and successful way to hunt hogs in Florida is out of a permanent elevated house blind over an automated feeder on private land. This is our most popular hunt that you can book here: https://huntinghogsinflorida.com/book-a-hunt/. Corn is the best bait, and you’ll want to sit no later than 4:00 PM, and hunt until dark. Wild hogs in Florida have very poor eyesight, but a sharp sense of smell and hearing. Many hog hunters in Florida get enjoyment out of grabbing a pair of binoculars, tracking the wind, and making their way toward an open shot. Hunting hogs in Florida with dogs is arguably one of the most intense experiences you can have in the sport of hunting. There’s nothing like letting dogs do what they love while getting up close on a hog with a knife. It’s a surprisingly quick and efficient harvest where you can almost guarantee an ethical kill. If you want to give this a try – we’re thankful to have some of the best dogs in the county, and you can book your hunt here: https://huntinghogsinflorida.com/book-a-hunt/. On private property with landowner permission, hog hunting in Florida requires no hunting license with no size or bag limit, and wild hogs may be hunted year-round using any legal rifle, shotgun, bow, crossbow, pistol, or air gun. On private property, you may also use knife and spear. Additionally, when hog hunting in Florida you can hunt at night with a light and/or night vision. To learn more please visit the FWC here: http://myfwc.com/hunting/by-species/wild-hog/.